5-star 320-room hotel in Mexico City. Now operated as a JW Marriott Hotel, it is an internationally renowned and award winning property - Conde Nast readers have chosen it as the "Best Overall Hotel in Mexico and Central America" and "Best Hotel for business travelers". 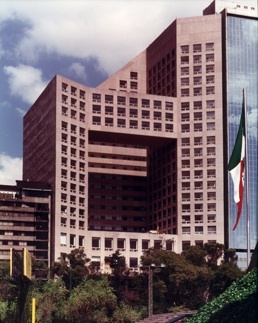 One of the premier Mexico City hotels, it offers luxury accommodations in the exclusive Polanco District overlooking Chapultepec Park and is within walking distance of museums, the city's financial hub, and some of Latin America's best shopping dining and night life. The building designed by Sordo Madeleño Arquitectos is well integrated into the urban landscape, presenting a striking face when viewed from the park. The interiors designed by James Marzo and Bilkey Llenas capture the sophisticated side of Mexico City. Furnishings and artwork reflect culture and craftsmanship of the country. Amenities include 3 restaurants and a lobby lounge, meeting rooms, spa and outdoor swimming pool, and underground parking. PM/A, coordinating with the pre-opening staff, communicated the Mandarin Oriental Hotel Group’s requirements to the developers, the design team and contractors during design, construction, procurement and fit-out of the property. Responsibilities included definition of the design responsibilities, selection, contract preparation and management of design team, design and construction progress reviews, cost and schedule reviews, quality control, and management of purchasing and installation of furnishings, fixtures and equipment.